Here we are looking back on another outstanding broodmare sired by Mahmoud, the wonderful Grey Flight. Bred in Kentucky by J. T. Taylor in 1945, she was sold to the Wheatley Stable owned by the Grand Dame of racing owners Mrs. Gladys Mills Phipps, final bid of $35,000, at the 1946 Saratoga yearling sales. Grey Flight became a stakes winner at two winning the Autumn Days Handicap for the illustrious stable, placing in six other stakes races that year. She came back at three to win the Flying Heels Handicap, placing in two more stakes. Grey Flight won a total of twelve races, placing fifteen times, from thirty-five races. Retired to the Phipps family broodmare band boarded at Claiborne Farm, Grey Flight would become one of the true legends in the history of Thoroughbred breeding. Here she produced fifteen foals, fourteen of which were winners, nine winning stakes races. Grey Flight is the ancestress of many champions and top ranked sires. Her best offspring to appear on the track was the 1955 champion three year old and handicap female Misty Morn by Princequillo, winner of the Monmouth Oaks, Gallant Fox Handicap, Diana Handicap and Molly Pritchard Handicap etc, during her championship season. 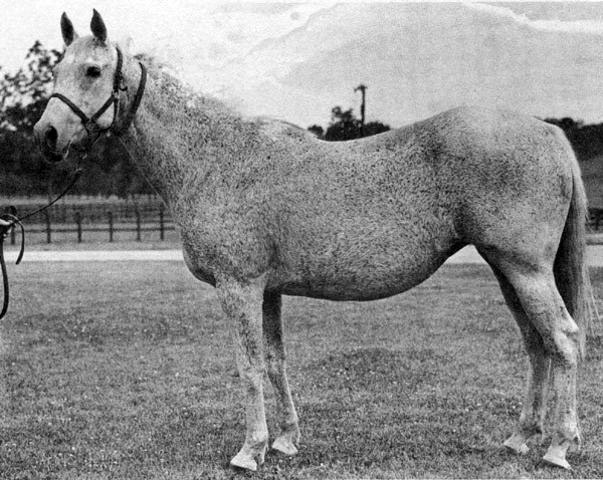 Misty Morn would then become a broodmare of the year in 1963. She produced five stakes winners herself, two of which won championship honours, the full brothers Successor and Bold Lad (USA), both by Bold Ruler, which reaffirms the affinity this female family had with the eight time leading sire, as well shall see. Bold Lad (USA) was the first of the two brothers, having been foaled in 1962. He won six stakes races during his championship year including the Hopeful, Sapling, Futurity, and Champagne Stakes. The next year he captured the Derby Trial Stakes and went off as the favourite for the 1965 Kentucky Derby but would suffer from anaemia and was taken out of training for the remainder of the year until he recovered. Bold Lad (USA) was brought back slowly by trainer Eddie Neloy, taking over from the recently retired Bill Winfrey, and won the Roseben and Metropolitan Handicaps as a four year old. There was another colt, bred in 1964, named Bold Lad (IRE) racing in Ireland that would also become a champion two year old, and to further add to any confusion, this second Bold Lad was also sired by Bold Ruler. The colts were not related on their dam family sides, hence the (USA)/ (IRE) designations to their names, but their owners were related. Gladys Phipps bred and owned Bold Lad (USA) while her twin sister, Beatrice Mills Forbes (the 8th Countess of Granard) bred and owned Bold Lad (IRE). Successor was bred in 1964 and during his two year old championship year he won the Champagne Stakes, adding the Tremont and Garden State Stakes. At three he won the Lawrence Realization Stakes. Two full sibling sisters named Bold Consort (Test Stakes) and Beautiful Day (National Stallion Stakes, Rosetta Stakes etc) were also stakes winner out of Misty Morn. Sunrise Flight by Double Jay was a good sound stakes winning son of Misty Morn making eighty-three starts in his career, winning eleven, including victories in the Gallant Fox and twice in the Tropical Park Handicap. Returning to Grey Flight, we she her as the dam of Bold Princess by Bold Ruler. Bold Princess was a winner of the Schuylerville Stakes before producing Intrepid Hero (Hollywood Derby, United Nations Handicap) by Forli. Intrepid Hero is best remembered at stud as the sire of Interco (Santa Anita , San Luis Rey and Century Handicaps). Bold Princess is also the dam of Predictable (Selima Stakes) by Tatan, and Sovereign Dancer by Northern Dancer. The latter’s claim to fame is as the sire of Louis Quatorze (Preakness Stakes), Itsallgreektome (Hollywood Turf Cup, Hollywood Derby), multi French Champion Priolo (Prix Jean Prat, Prix Jacques le Marois, Prix Moulin etc), and multi stakes winners Bolshoi Boy, Court Countess, Sovereign Don, Wall Street Dancer and the unforgettable and eccentric Gate Dancer (Preakness Stakes, Super Derby), he of the white ear muffs worn while he raced, making him appear as an equine Easter Bunny. Another top producer from Grey Flight that was sired by Bold Ruler was Clear Ceiling. This daughter of our subject became the dam of stakes winner Infinite and stakes producer How High The Moon by Majestic Prince. The latter is the dam of Double Sunrise who produced champion sprinter Kona Gold (Breeder’s Cup Sprint etc). Clear Ceiling also produced Quick As Lightning (1000 Guineas) by Buckpasser, and Pure Profit by Key To The Moon. Pure Profit in turn is the dam of the incredible Inside Information (Breeder’s Cup Distaff, Spinster Stakes, Ruffian Handicap, Acorn Stakes etc) by Private Account and Educated Risk (Frizette Stakes, Top Flight Handicap etc) by Mr. Prospector. Grey Flight also produced minor stakes winner Pleasant Flight by Bold Ruler. This one is the dam of Flitalong and Spring Is Sprung, both sired by Herbager. The latter produced Primevre, who in turn is the dam of Priolo. This mating created a 3×4 inbreed to the Bold Ruler – Grey Flight cross. Additional offspring from Grey Fight include Misty Flight (Remsen Stakes) by Princequillo, Bold Queen (Black Eyed Susan Stakes) by Bold Ruler, multi stakes winners Grey Phantom and Full Flight both by Ambiorix, and Sport Page Handicap winner Misty Day by Nasrullah. The crowning achievement for Grey Flight pertaining to future pedigrees however is as the dam of her only son by Bold Ruler. What A Pleasure would become one of Bold Ruler’s more successful sons at stud. He led the North American sire list two years in a row, 1975 and 1976, when he sired two consecutive champion juveniles. Foolish Pleasure won the Champagne, Hopeful, and Sapling Stakes etc at two during his championship season. He followed the next season with wins in the Kentucky Derby, Flamingo Stakes and Wood Memorial Stakes at three. At four Foolish Pleasure would add the Suburban Handicap, the Arlington Invitational and Donn Handicap to his stakes winning tally. At Stud Foolish Pleasure is the sire of Filago (Oak Tree Invitational), Kiris Clown (Sword Dancer Invitational Handicap), Marfa (Santa Anita Derby), Market Control (Queen’s Plate), Baiser Vole (Poule d’Essai des Poulins, Prix Robert Papin, Prix de la Salamandre), Bayford (Champion two year old in Canada), and multi stakes winner Maudlin. The other juvenile champion sire by What A Pleasure is Honest Pleasure. Honest Pleasure captured the Champagne Stakes, Arlington Futurity and the Laurel Futurity Stakes during his two year old championship season. At three he won the Flamingo Stakes, Blue Grass Stakes, Travers Stakes and the Monmouth Invitational Handicap. What A Pleasure is also the sire of multi stakes winner Gene’s Lady, and For The Moment (Futurity Stakes, Blue Grass Stakes), who is a full brother to Honest Pleasure. What A Pleasure is the dam sire of Gilded Time (Breeder’s Cup Juvenile), and Tasso (Breeder’s Cup Juvenile, Del Mar Futurity). Grey Flight has been one of the most important broodmares for the Phipps family Thoroughbred endeavours. This is exulted company when one considers the amount of exceptional broodmares that have produced so many champions and high calibre horses for many decades of the family’s racing patronage. The dam of Grey Flight is Planetoid by Ariel. Ariel is a grandson of Sweep by Ben Brush. This represents a solid and proud established male line of purely American breeding. Sweep is also the dam sire of Planetoid, making her closely inbred to the former two time leading sire 3 x 2. Planetoid was a grey, and traces back to Roi Herode, the sire of The Tetrarch, who is also three generations back in the pedigree of Mahmoud, sire of Grey Flight. Thus Grey Flight has Roi Herode 5 x 4 in her pedigree. Grey Flight lived until the age of twenty-six, when she passed away due to her advancing age. She had been retired from breeding two years prior, and was well cared for by the Claiborne staff who truly loved the old grey mare. What great reading .i must get Diane Neylon the best pedigree expert to find a mare that traces back to that family.